For single mum Kate O'Hara, there was no decision to make. Her daughter Rosie is one of a small percentage of Irish children with a disorder that prevents her from being vaccinated against measles. All Kate can do is hope that herd immunity keeps the disease at bay, and her little girl safe. For Madeleine Harrington, it was a leap of faith she wasn't prepared to take. Which is why she and her husband decline controversial measles jabs for their daughter Clara. All she can do is pray that it's the right decision and if her little girl becomes sick, she gets through it unscathed. The two girls have just started primary school in the same class. And when one day, tell-tale red spots appear on Clara Harrington's chest, and Rosie's a few days after, both mums fear the worst...how can this be happening when all they wanted was to keep their children safe? 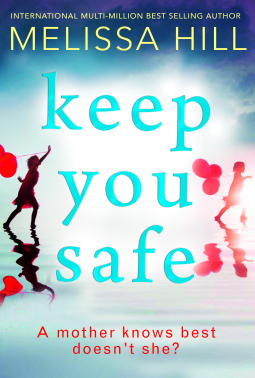 Keep You Safe by Melissa Hill is most certainly an issue driven book. You may never have considered vaccination as an issue. My generation took it for granted as something you just did. I still highly value the blessing vaccinations bring in countering many illnesses. Yet there are those who differing thoughts about it. I have a niece who does not believe in vaccinations for her children, and it worries me, so when I read Trish at Between my Lines review, for Keep You Safe I knew it was a book I wanted to read. It is a highly engaging story, tracing the story of two children who contract measles, one recovers and one suffers some serious side-effects. The book explores the two sides, that of mother Madeleine and that of Kate. Both women are so plausible and as a reader my sympathies were with both of them. The heart ache that both experience tugged at my heart. What are their reasons for not vaccinating, what are the consequences and risks of that? I hadn't thought of one of the consequences explored so that was thought provoking. The way the story moves along, with a local community plus an online presence is interesting. Madeleine is a blogger and when things turn pear-shaped the amount of judgement and vitriol was saddening. There is a court case that follows that further reveals personalities, and there is a surprise ending. I knew there would be one but wasn't sure what it would be. This is most definitely a book I'd recommend, both for the issue it explores, but also the plot and characters make for a highly readable book, with just a small taste of romance to add in that was a small but beautiful addition. This one sounds interesting...I am intrigued by the issues, even though I would have never considered skipping vaccinations for my children. However, my parents did not have us vaccinated as children...only in adulthood did I go through that process.